Epcot's America Pavilion | What's the Point? Welcome to this month's Blogorail Green Loop. Today we are taking you on a virtual tour of Epcot's World Showcase. Phew, walking around the Epcot's World Showcase can be exhausting, but you made it to the back of the park, directly across from the park's entrance. Wait, where are you going? Don't you dare skip past America! Sure, if you're American, I can imagine that a tour of your home country may not be as exciting as sipping champagne in France, watching acrobats in China or sampling tacos in Mexico. 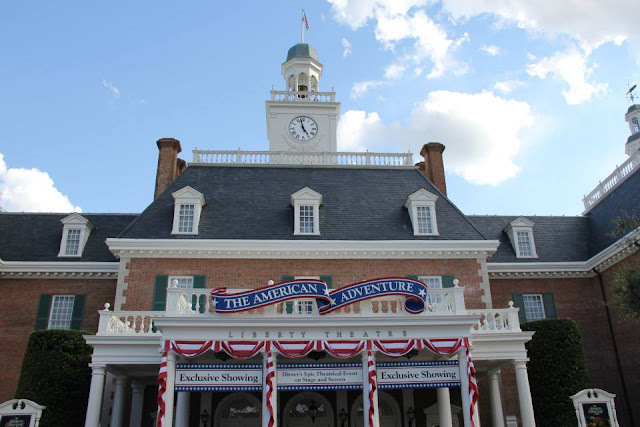 However, the American pavilion, the American Adventure, has a lot to offer so before you head to have a cannoli in Italy or sushi in Japan (everything has to do with eating, naturally) slow down and take in the sights and sounds. Hosted by Mark Twain and Benjamin Franklin, the American Adventure is an audio-animatronic show about the history of America, American life and offers a glimpse into the different time periods that have played a role in creating the America of today. Starting from the Pilgrims harrowing journey to America for religious freedom, and expanding through the pains of Civil War and the Industrial Revolution, the show is a great reminder of how far we have come as a country and the lessons we've learned throughout our history. The beautiful theater truly fits the presentation, and is a great place to kick back and relax during a busy day. 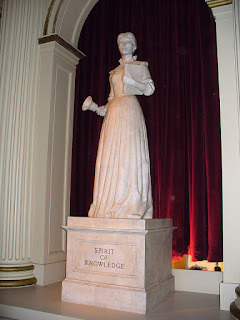 Around the theater are 12 statues representing the spirits and ideals of America. The half hour show culminates with a video highlighting famous people and noteworthy moments in American history, including first responders on September 11th. The video features one of my favorite Disney tracks, Golden Dream, which you can listen to below. If you haven't seen the a capella group, Voices of Liberty, I demand you stop what you are doing and get to Epcot as soon as possible. 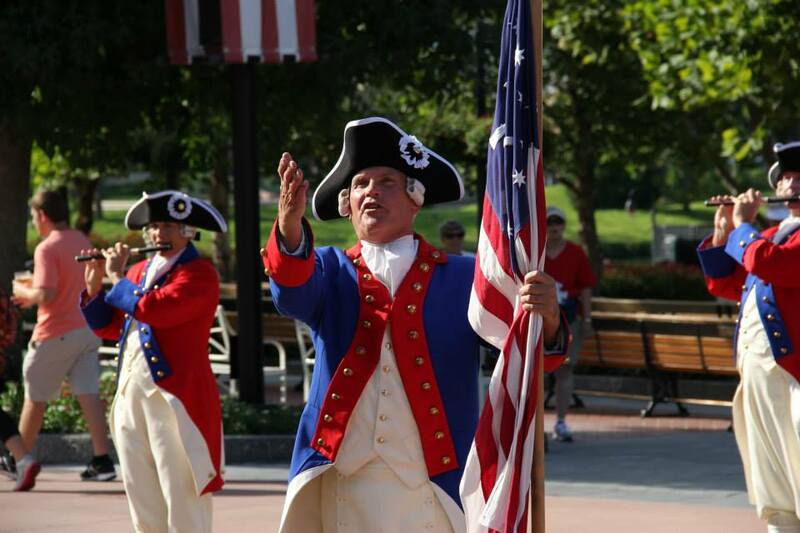 The Voices of Liberty are eight very talented singers who appear throughout the day at the American Adventure. Their voices perfectly capture the American spirit, and they always put on a fabulous show. There's nothing I can say to perfectly capture how amazing they are, so I will let you watch them instead. Check your times guide or My Disney Experience mobile app for show times. Ok, so we aren't exactly known for our food, so the American Adventure doesn't have a sit down restaurant. If you're interested in a little light, quick American fare, stop into the Liberty Inn for a burger, fries, chicken fingers, etc. Better yet, enjoy one of the outside stand where you can get one of my favorites, funnel cakes or turkey legs. 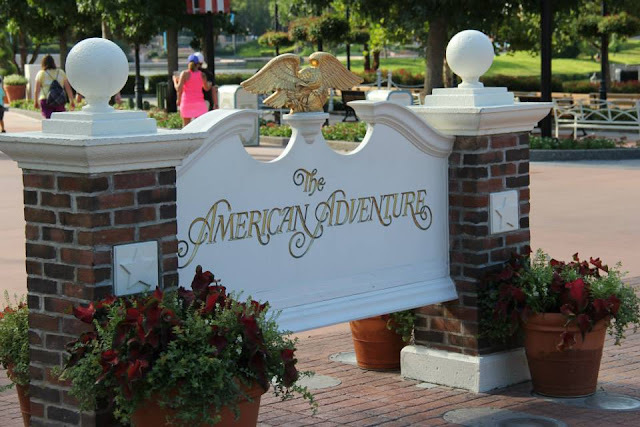 There isn't a ton of shopping at the America pavilion, but you will find one of my family's favorite shops to the right of the entrance of the American Adventure theater, Heritage Manor Gifts. Here you will find some patriotic Disney merchandise and we always seem to find something to take home from this small, secluded shop. On your next trip to Epcot, be sure to spend some time in your home country! What's your favorite part of the American Adventure? Tell me in the comments below. And thanks for taking this virtual tour of Epcot's World Showcase with the Blogorail! For more info on Epcot's World Showcase, check out the other great posts from the Blogorail! 5th Stop - Dad for Disney | O Canada!